You can also count on the Katy Window Company for all of your rain gutter services including gutter installation and gutter cleaning services. Why clean your gutters? Cleaning the gutters is one of those home maintenance tasks that often gets overlooked until it’s too late. Dirt, debris, and tree leaves accumulate in gutters causing overflows and potential water damage. In the winter, snow and ice can cause snow and ice dams which have similar damaging effects. Don’t have gutters? Without rain gutters, rain water rolls down your roof and collects along the perimeter of your home, soaking your foundation and potentially seeping into your basement. 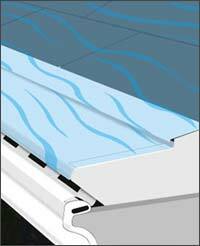 Rain gutters divert the water, allowing you to control its flow and ensuring better drainage. We install quality rain gutters designed for optimal drainage and resistance to debris accumulation.